While MMA fanatics are scouring the Internet for the first snippets from Tuesday’s unforgettable – and by unforgettable, I mean completely awesome – UFC 117 pre-fight conference call, here are the highlights from today’s one-sided Q&A. Middleweight champion Anderson Silva and Chael Sonnen were both on the call, however the challenger was the only one that actively participated. For some auspicious reason, “The Spider” wasn’t in the mood to play today and willingly allowed his outspoken rival to dominate the mic. The arch enemies will do battle inside the Oracle Arena in Oakland, CA on August 7th. If you ask Sonnen, it will mark Silva’s last day of Octagon employment. -Silva is asked if this is his most anticipated UFC fight. “No,” he replies. -Sonnen says he’s the toughest guy in the UFC and nobody including Anderson Silva can out-tough him. -Sonnen says he gives coherent answers to questions while Silva just gives “yes” or “no” answers. -Silva is asked about UFC president Dana White’s comment that he could be cut from his contract with another bad performance. Silva replies that White can say what he wants to say. Silva replies to a pair of followup questions by simply saying “no” again. -Sonnen labels a question about his loss to Demian Maia (who Silva defeated) “ridiculous” and mentions Vitor Belfort as the likely next challenger. -Sonnen says Silva has the right to do whatever he wants to win a fight, but that he just doesn’t like Silva. He says he’ll take Silva’s belt August 7 and Dana White will fire Silva on August 8. -Silva is excited about the fact all the main UFC 117 bouts are US vs. Brazil, while Sonnen says Americans tend to root for whoever they like and will go back and forth rooting for fighters. -Sonnen says nobody likes Silva, nobody wants to sponsor him, and nobody wants to wear what he wears. He adds that he has sponsors and does very well with that. -Sonnen indicates he hasn’t watched much tape on Silva yet but plans to soon. -Sonnen disses previous Silva opponents as a “math teacher from Ohio” (Rich Franklin) and “one legged fighter from Canada” (Patrick Cote). -Silva says fans don’t always understand what’s happening in the cage so he doesn’t blame them for booing him. As for Sonnen’s comments about Silva, Silva says he finds those comments funny. -“Of course I’m promoting the fight myself!” Sonnen says. Sonnen says none of the fans care about Silva and doesn’t even know why Silva is on the call. 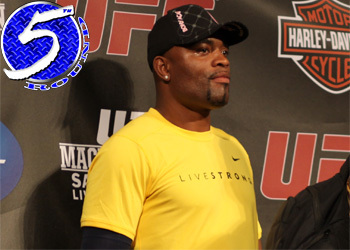 -Silva says everyone has their own way of promoting a fight and this is Sonnen’s way. Silva adds that he doesn’t talk a lot of nonsense but he’s going to come to do his job on August 7. -“Of course” Sonnen is deserving of the title opportunity, Silva says. -Silva says he isn’t bored with the middleweight division and is prepared to stay there. He wants to retire at 185 pounds. -Sonnen says he doesn’t know what “hype” means. He isn’t phony, he’s genuine in his comments, and he just responds to questions from reporters. -Sonnen notes this is clearly the biggest fight of his career. -Sonnen describes Silva as a scary fighter. Sonnen says he plans to deal with the pain and walk out with the title at UFC 117. -Silva seems to rule out a catchweight fight at 205 pounds with Mauricio “Shogun” Rua or 170 pounds with Georges St. Pierre, instead saying fighters can come to his weight class. -Sonnen accuses Rich Franklin and Anderson Silva of ducking him and says he won’t give Franklin a title shot if he beats Silva. -Silva says people aren’t paying to watch fighters talk back and forth, they’re paying to see them fight and he’ll come to try to finish the fight as quickly as possible. Sonnen disagrees, noting that talk sells fights. “Guess what dummy, I’ve been training really hard since I was 9 years old and I still have time to talk about the fight,” Sonnen says. -Sonnen asserts that he has a better MMA resume than Silva even if Silva has the better UFC resume. -Sonnen says it will be a challenge to get Silva to the ground and that Silva has a good grappling game as well.